Searches for the missing people are underway in the southwestern region, where several days of heavy rainfall has resulted in flooding and landslides. 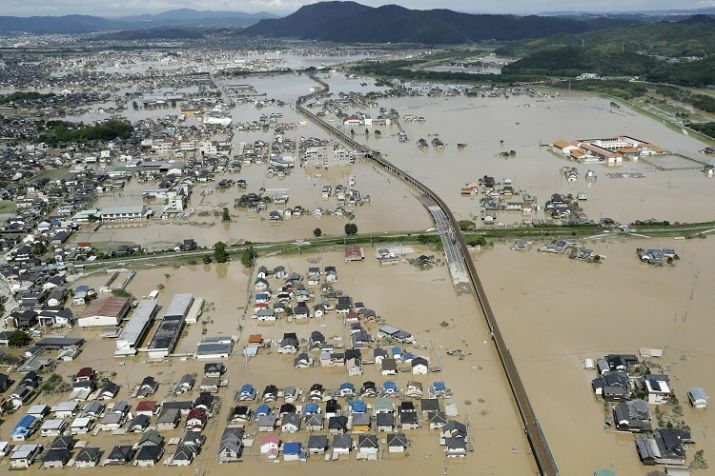 At least 100 people have died or have been presumed dead after heavy rains, floods and mudslides struck western Japan, the Japanese government said. Heavy rainfall hammered southern Japan for the third day, which prompted new disaster warnings on Kyushu and Shikoku islands on Sunday. Cleanup efforts and searches for the missing are underway in the southwestern region, where several days of heavy rainfall has resulted in flooding and landslides. The Japanese government confirmed that 92 people are missing, mostly in the southern area of Hiroshima prefecture. Nearly 40 helicopters are out on rescue missions. "Rescue efforts are a battle with time," Prime Minister Shinzo Abe told reporters. "The rescue teams are doing their utmost." The Japan Meteorological Agency said three hours of rainfall in one area in Kochi prefecture reached an accumulated 26.3 centimeters (10.4 inches), the highest since such records started in 1976. Authorities warned that the landslides could strike even after rain subsides, as the calamity worsened in decades. Kochi prefecture issued landslide warnings almost over the entire island. An emergency office has been set up by the Japanese government, which is designed for crises such as major earthquakes. People in Japan are pleading for help through social media. The rivers throughout the hard-hit areas have swelled. Police, firefighters and other disaster relief have been sent to places.